Innovation and finance are in a symbiotic and twin-track relationship: a well-functioning financial system spurs innovation by identifying and funding stimulating entrepreneurial activities which trigger economic growth. Innovations also open up profitable opportunities for the financial system. These mutual dynamics cause and need innovative adaptations in the financial system in order to better deal with the changing requirements of a knowledge-based economy. The volume comprises different contributions which focus on the central imperative of this evident connection between financial markets and innovation which, despite its importance, is only barely considered in academia, as well in practice so far. The book is about the mutual interdependence of innovation processes and finance. This interdependent relationship is characterized by a high degree of complexity which stems, on the one hand, from the truly uncertain character of innovation and, on the other hand, from the different time scales in both domains. Whereas innovation processes are long-term and experimental, financial markets are interested in shortening time horizons in order to optimize financial investments. Economies which do not manage to align the two realms of their economic system are in danger of ending up in either financial bubbles or economic stagnation. The chapters of this book deal with different aspects of this complex interrelationship between innovation and finance, highlighting, for example the role of stock markets, venture capital and international financial transactions, as well as the historical co-development of the financial and industrial domains. Thus far, the communities in economics dealing with both issues are almost completely disconnected. 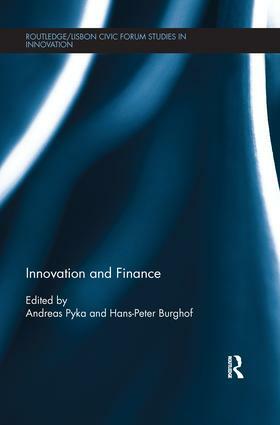 The book brings together economic research dealing with the interface between innovation and finance and highlights the importance of the Neo-Schumpeterian perspective. This topic is of particular interest in the current economic crisis affecting the Eurozone and its currency. Most of the policy instruments discussed and implemented so far are focused on short-run targets. This discussion of the relationship between innovation and finance suggests a long-run perspective to create new potentials for economic growth and a sustainable way out of the economic crisis.